Pat Robertson is the founder CBN, the Christian Broadcasting Network. He is described on the CBN website as a broadcaster, statesman, author, humanitarian, businessman and Christian. At first glance, Robertson may seem to be a sensible, moderate Christian leader in a sea of con men, phonies, and outrageous apostasy. But scratch the surface a little and you’ll find one of the greatest deceivers in the church world today. CBN began in 1961 as a low power UHF station in Portsmouth Virginia. By 1963 Robertson had established the 700 Club. This was to be a “club” of 700 viewers each giving $10 per month thus enabling CBN to meet its $7,000 budget. This partnership concept worked so well at raising money that Robertson made the 700 Club the cornerstone of his TV ministry. We’ll get back to CBN in just a moment but first let’s look at some of the heretical associations Robertson has endorsed over the years. Robertson is a big proponent of ecumenism, meaning cooperation between all religions. The ultimate goal of ecumenism is the establishment of a one world religion. To this end Robertson was one of the signers of the notorious Evangelicals and Catholics Together document. This heretical document laid the groundwork for Christians and Catholics to unite to bring about social reform in the world. In defense of his association with this apostate group, Robertson stated that minor points of doctrinal difference shouldn't obscure the document's goals. If Pat Robertson considers the differences between Catholic doctrine and true biblical Christianity to be “minor” then he is clearly either deceived or a deceiver himself. Pat Robertson has endorsed the heretic Benny Hinn. Hinn was a guest on the 700 Club after CNNs expose of him. Robertson gave Hinn a forum for his fake apology. Robertson has endorsed the so called laughing revival brought to the U.S. by Rodney Howard Browne. On October 27, 1994 Robertson said this about holy laughter: “...what this says to me is revival is taking place in the world in a mass wave...and we look to the coming of the Lord. I think this is a very encouraging sign in the middle of all this trouble and all these wars and all this confusion. God is saying I'm on the throne and I'm going to touch multiplied millions. It's wonderful. 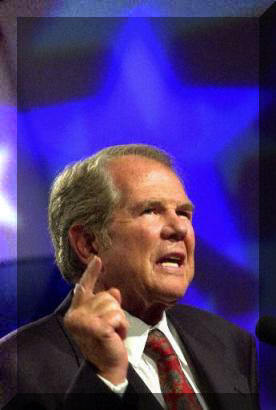 I applaud it.” In 2003 Pat Robertson endorsed the rule of Liberian dictator Charles Taylor. Taylor’s government was backing a rebel faction in neighboring Sierra Leone. The rebels were accused of extreme brutality. Taylor has a long history of corruption. In 1983 as head of the Liberian governments General Services Agency, he was accused of embezzling more than $900,000 in government funds. He fled to the U.S. where he was arrested in Boston. While awaiting extradition back to Liberia, Taylor escaped from jail thus becoming a fugitive from justice. In support of Taylor, Robertson declared in July of 2003 “So we're undermining a Christian, Baptist president to bring in Muslim rebels to take over the country,” What Robertson failed to mention at the time however was his own $8 million investment in a Liberian gold mining operation he made under an agreement with Taylor's government. According to a 1997 article in the Lubbock Avalanche Journal, Robertson’s financial interests in Africa extend to diamond mines as well. In fact the former chief pilot for Operation Blessing claims that most of the supposedly humanitarian aid flights to Zaire were in fact mining related. Airplanes sent to Zaire by evangelist Pat Robertson's tax-exempt humanitarian organization were used almost exclusively for his diamond mining business, say two pilots who flew them. Three airplanes were flown to Zaire in September 1994 by Operation Blessing. However, chief pilot Robert Hinkle said only one or two of the roughly 40 flights during his six months in the country could be considered humanitarian. All the rest of the flights were mining-related, he told The (Norfolk) Virginia-Pilot. "We hauled medical supplies one time," Hinkle said in a telephone interview. "It might have been about 500 pounds at the most. It was a very minimal amount." The planes were capable of carrying about 7,000 pounds, he said. Notes that Hinkle kept during most of the flights contain entries for 36 flights, the newspaper said. Of the 17 that mention the purpose of the trip, 15 are related to diamond mining. Robertson's company, African Development Co., based in the Zairian capital of Kinshasa, sought to dredge diamonds from a remote jungle riverbed. Robertson is the president and sole shareholder of the company. So as you can see Pat Robertson has a long history of using his “partners’ tax free donations for his personal business interests. Which brings us back to CBN. In 1977, Robertson became the first Christian broadcaster to build and operate his own cable television network, CBN cable, later renamed the Family Channel. By 1981, CBN cable was in 10 million homes making it one of the most successful and profitable cable networks in the country. CBN cable was so successful in fact that eventually Robertson got an offer he couldn’t refuse. In 1990 Pat Robertson sold CBN cable to International Family Entertainment Inc. (IFE), a publicly held company that trades on the New York Stock Exchange. So what do you suppose Robertson did with the proceeds from the sale of the Family Channel. If you think he shared them with his “partners’ you’d better think again. No, he did what he’s always done. He pocketed those profits and made himself and his family quite wealthy. But what about your partners Pat? What about all those people who gave, perhaps sacrificially so that you could build your television empire. If they are your “partners” shouldn’t they have shared in your great good fortune? Are they really partners or are they just sheep to be fleeced? Pat Robertson is a wolf in sheep's clothing. He is one of the false teachers and false prophets that we are warned about in scripture. He uses covetousness to make merchandise of God’s people. He needs to repent, get off the air and return the money God’s people have sent him over the years. And if you’ve been a Pat Robertson supporter you need to repent too. Pat Robertson certainly has the right Doctrine as far as Jesus' Salvation message, he just is a false prophet when it comes to prophesying. His spending methods and accountability are also questionable.